Again, I managed to get in with a last-minute reservation made the same morning for an early dinner. My prior visit was before they received their Michelin star. Their menu approach has changed a little since the last visit. 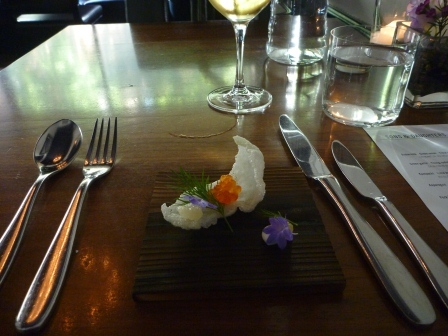 Instead of pairs of choices, they offer a tasting menu for the season. On the flip side, they offer a vegetarian tasting menu, where any meats/fish/shellfish ingredients are substituted. Otherwise, the menus are very similar. They also let me switch out parallel items from the vegetarian menu to the regular menu. I swapped the mussel course and the pork belly course, but otherwise I was on the regular menu.